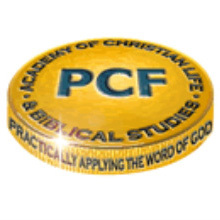 The PCF Academy of Christian Life and Biblical Studies was launched and started on Tuesday 9th October 2001. The Bible Academy exists to help Christians develop and mature in their relationship with Christ. We aim to get Christians to the pin-point where they will be able to ‘practically apply the Word of God’. Use tutors who have an anointing, a sound knowledge of the Bible and are able to reach a wide audience by their presentation skills and abilities. Reach the ever increasing needs of the church by providing teaching sessions on practical, every-day topics that are relevant for living today through Biblical texts. Provide an arena for everyone (of all ages) to learn in a non-pressurised and relaxed environment. For further information please contact The ACLBS Administrator by email at aclbs@tpcf.org.uk.